Leaning back in his drafting chair, Brandon Dugan studies a succession of neon images as they appear on the monitor above him. His chair is rigid and small, but Dugan does his best to get comfortable as he settles into his six-hour shift glued to the monitor, tracking the peaks and valleys of the submarine canyons below. It’s Saturday night aboard the R/V Neil Armstrong, and Dugan, a hydrogeologist with the Colorado School of Mines, is sitting in the main lab as the ship cruises over the US Atlantic continental shelf. 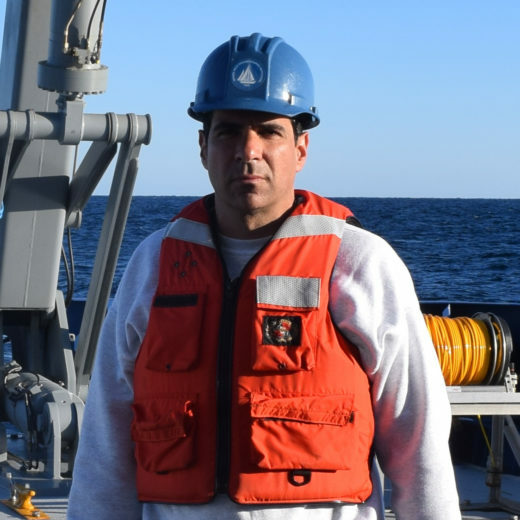 Along with geophysicists Rob Evans and Dan Lizarralde from the Woods Hole Oceanographic Institution (WHOI), Dugan is looking for signs of methane gas leaking from the seafloor. The methane, which can be released from the melting of gas hydrates triggered by a warming ocean, can hint at a bigger problem: weak areas along the shelf and, potentially, the site where a massive submarine landslide could occur. The vast majority of seafloor landslides go unnoticed—too small and weak to be noticed from the surface. But if they’re big enough and fast enough, they can generate dangerous tsunamis, like the one that hit the Canadian Maritimes and the northeast US in 1929. On November 18, at 5:02 p.m., a magnitude 7.2 earthquake ruptured off the coast of Newfoundland. The shaking caused a block of sediment the size of New Jersey to slump off the edge of the continental shelf. Portions of this block plummeted 1,000 kilometers at speeds above 50 kilometers per hour, ripping through a dozen transatlantic telegraph cables as it fell towards the abyssal plain. The landslide triggered a wave as high as seven meters in some places that slammed into the shore from the Maritimes to the Carolinas. Twenty-eight people died. Since then, things have been seismically quiet off the east coast of North America. But researchers have recently ramped up efforts to survey the shelf for signs of potential tsunami-triggering slumps and failures. They want to find out if and where the next “big one” may be brewing. “By looking for methane gas expulsion, cracks, and pockmarks, we can make some estimates on areas that are more likely to have slides, and thus have a higher potential for a large-scale submarine avalanche that might generate a tsunami,” says Dugan. The Neil Armstrong is creeping along at seven kilometers per hour, pinging the sea with sonar, looking for methane bubbles. Suddenly, a vertical green spike forms on the right-hand edge of the monitor and starts rising like a sprinter’s pulse. Dugan climbs out of his make shift recliner and inches closer to the monitor. And there it is: a massive plume of methane taller than a skyscraper, burping out from the base of Veatch Canyon, southeast of Martha’s Vineyard. But tracking methane is only one part of the story. The scientists are also interested in calculating the rate at which sediment is accumulating on the shelf, and piecing together the history of past earthquakes in the region. Days later, the Neil Armstrong heads back to port in Woods Hole, Massachusetts. Along the way, the team makes a second pass over Veatch Canyon, to do some high-def reconnaissance of the monster plume. A deep-sea camera rig developed by WHOI, called TowCam, drags along the canyon for the photo op. No gas bubbles show up. Dugan and company gaze at the monitor as sand, rocks, and the occasional lobster pass by. They’re surprised that the gas seepage has stopped—particularly given the Saturday night plume-a-thon they’d witnessed on the trip out. But Dugan suggests the extra surveying is useful even when they don’t see the things they’d expected to see. There are no tsunami warning sirens blaring off the East Coast, but the scientists plan to keep a watchful eye on how the shelf evolves. For now, Dugan is content to wait until his next research cruise, when he’ll lean back in his awful chair and keep his eyes peeled for the next flash of green. Cite this Article: Evan Lubofsky “Sizing Up the Tsunami Threat,” Hakai Magazine, Aug 10, 2016, accessed April 21st, 2019, https://www.hakaimagazine.com/news/sizing-tsunami-threat/.